When Skrimp Shack announced that they’d be opening a Charlotte location earlier this year, people went crazy with excitement! I had never heard of them, but after a quick check of their reviews I joined in on the excitement. With nicknames like the Chic-Fil-A of fish sandwhiches and the Five Guys of seafood being thrown around, how could you not get excited. If you are a fan of seafood in Charlotte, this spot should definitely be on your radar as well. Fast forward to now, and they are finally open in South Charlotte so I had to go! Finding the restaurant is easy and parking is plentiful since it is located in the McMullen Creek Shopping Center. I got there right after opening time to avoid the lines(I’d suggest you do the same for now) so we were able to get in and get a table quickly. The decor fits the name really well creates a welcoming ambiance. The staff and service there was super friendly, which is how they’ve gotten the Chic-Fil-A comparison. The restaurant is on the small-medium size, so just make sure you arrive early to secure a table. It’s really a great option when you want quality seafood in a fast casual manner. Although they are named Skrimp Shack, they do have several other options as well. There are several different types of fish to choose from, crab cakes, scallops, oysters, and some chicken options. Since this was my first time, I had to get their staple Shrimp and Crab Po Boy with a side of hush puppies to start. They loaded this thing down with shrimp and crab! Make sure to get the secret sauce. I got the spicy sauce on mine and it made it even that much better. I’m not sure what they put in that sauce, but as a sauce connoisseur this sauce is a STAR. I could put it on just about anything. The “skrimp” were cooked to perfection and crab makes everything better. I love this po boy! The hush puppies were also really good so if you are a hush puppy fan you are in for a treat. Next up, I had the Skrimp and Whiting basket with a side of collards. Again the shrimp was fried perfectly and not overcooked, which I see a lot. The fish had a light batter that complemented it well and this too was fried to perfection. The basket was great and definitely a good option for those who want both their fish and shrimp fix. Skrimp Shack also boast that they have the best fish sammich in town, and I can’t argue with that. It’s definitely up there in the rankings and adding the sauce might just put it over the top. Their sandwiches are huge! With often 3-4 pieces of fish on every sammich, it’s safe to say they have the fattest fish sammiches around as their motto goes. 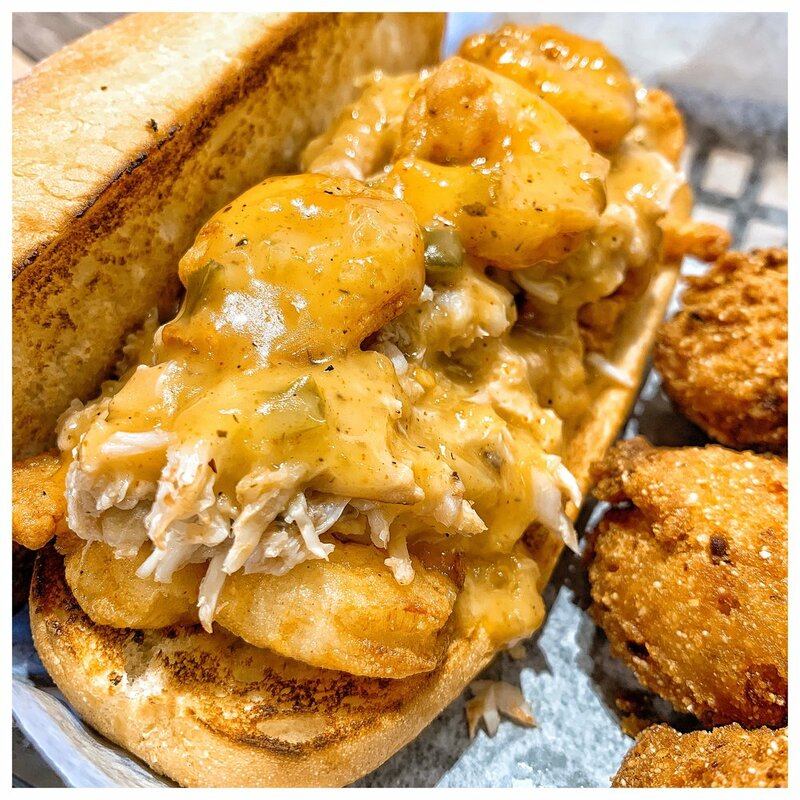 This is definitely another great option at Skrimp Shack Charlotte. I definitely will be going back to try some of the other items and updating the blog as I go! Stay tuned for more coming soon! Join with the countless others to never miss a special again!